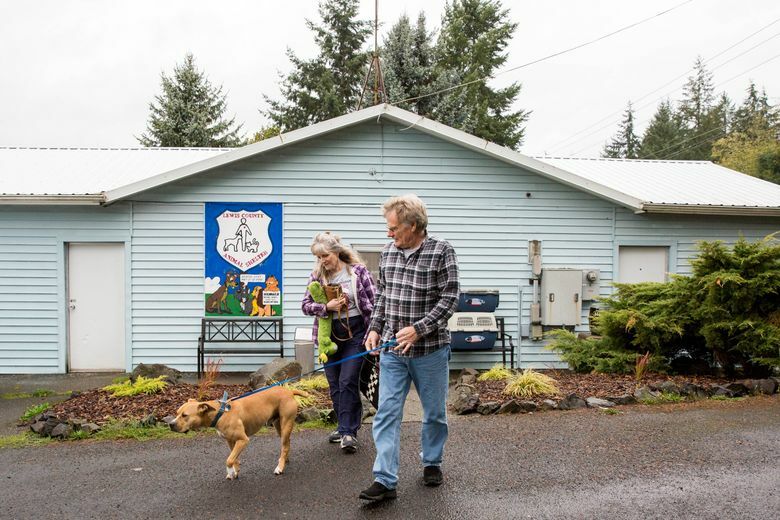 After months of legal battles in various courtrooms, hundreds of pages of court documents and hundreds of thousands of online petition signatures, Hank the dog, a pit-bull mix set to be euthanized as a dangerous dog, was freed Wednesday from the Lewis County Animal Shelter. 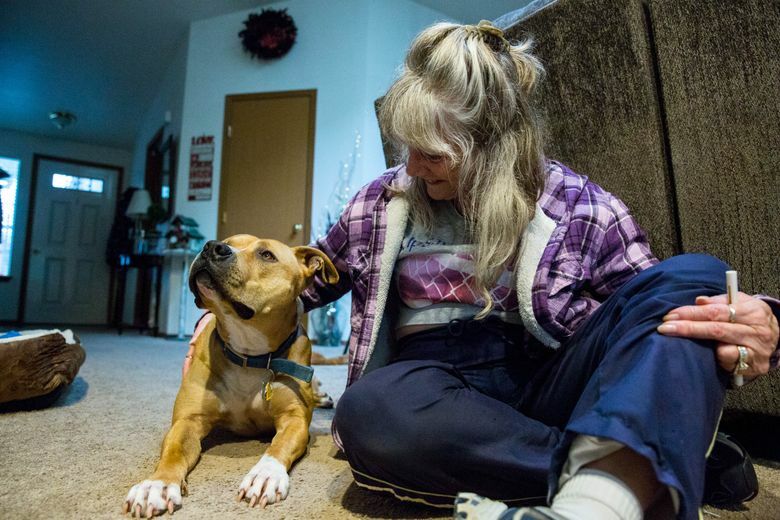 CHEHALIS — So now we have the story of Hank the dog, the 2 ½-year-old pit-bull mix destined for euthanasia, whose cause had embroiled Lewis County. On Wednesday, after months of legal battles that totaled about 465 pages of court documents, he was set free — for now. By this point, all three of the county’s Superior Court judges had recused themselves, each saying they knew somebody connected. It bounced to five different courts and ended up in Thurston County. An online petition to save Hank had 364,000 signatures, most from the United States but also from a variety of countries — Belgium, Argentina, Canada, Grenada. Another online petition gathered 155,000 signatures. Hank’s legal troubles date back to April 1 of last year, when he and another dog — his mother, Sadie — were reported to have mauled and killed two of a neighbor’s goats, and a pony’s face was bitten. It was a gruesome description. “Chase it around, killed it by the neck, shaking it, everything,” was how the neighbor, Julianna Engel, described to police the two dogs attacking one of her screaming goats. At a hearing three weeks later at the county’s Public Health & Social Services, Hank and Sadie were found guilty. County code calls for a dangerous animal to “be humanely destroyed” if there are no other options. One “other option” is for the county approving “proper enclosure” for the dangerous animal and the owner getting insurance of “not less than $500,000” to cover injury or damage caused by the animal. Debra Parscal, the owner of the two dogs, told The Chronicle newspaper that serves the county of 76,000 that she couldn’t come up with the insurance money. So Hank was taken to the animal shelter, and a district-court judge ordered Hank’s death. At that time, his name was “Tank,” an appropriate enough name, given his rectangular build. But Tank, caged in an isolation area for several months, grew on the shelter’s staff. Tank was “inexplicably not destroyed,” the judge would later write. It was while at the shelter that Tank got a name change. He became Hank. You know, a new start, certainly less intimidating-sounding for the tan-and-white dog. For a time, the case also ensnared Hanson and her boss, Danette York, the director of public health and social services. They faced criminal charges for essentially feeling sorry for Hank and adopting him out. They were charged with allowing a dog deemed dangerous to be outside of a proper enclosure, unmuzzled and unrestrained. The charges were later dropped. In any case, Hank’s supporters say the wrong dog was accused. They claim Hank was just frolicking around the scene of the crime, and it was his mom who did the killing. Guilt by association, they say. Hank’s mom, Sadie, didn’t end up in the shelter but is now in Oklahoma with someone who said he’d take care of her, according court documents. Parscal never explained why only Sadie was shipped out. She couldn’t be reached for comment this week. At first, Propp-Estimo says, Hank had some kind of tag stating he was not available. “I said, ‘I want this dog,’ ” she remembers. Whoever she talked to at the shelter left for a short time, Propp-Estimo says, came back and said that Hank was available. She paid the $70 adoption fee, filled out the required paperwork, and Hank had a new home. Propp-Estimo says no mention was ever made of Hank’s rap sheet. For four months, it was happy times at the Propp-Estimo household. Then, on May 9, she got a phone call from the sheriff’s office. Then a detective and his supervisor arrived. They took Hank back to the shelter. The prosecutor’s office had finally asked what had happened with Hank. What? Adopted out! The protracted court battles began. Propp-Estimo contacted Adam Karp, a Bellingham attorney specializing in animal law, whose previous cases have made the news. She wanted her dog back. In June, Karp filed a claim against the county for $250,000 for the “thousands” spent caring for Hank that included a $3,000 fence enclosure, and for “severe emotional distress.” He then filed a lawsuit on behalf of Propp-Estimo that included claims of breach of contract and violation of federally protected constitutional rights. Could Hank have been freed if Propp-Estimo had bought the $500,000 in insurance coverage, as was asked of Parscal? “At the time Hank was seized without a warrant, no such option was given to her, nor would it have been appropriate. She had already paid for Hank without any insurance requirement,” Karp says. 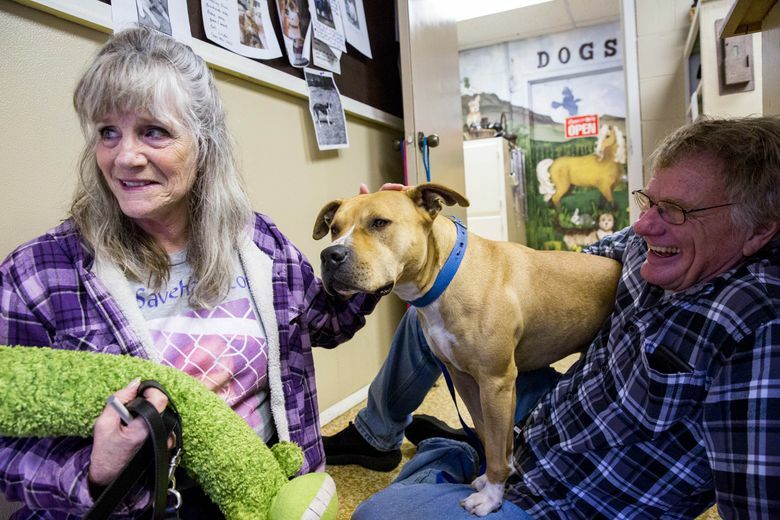 Propp-Estimo, 65, made daily visits to the shelter to give treats and talk to Hank. 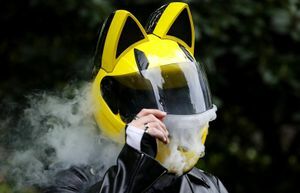 She’s retired after 22 years in IT, so she’s very familiar with the digital world. She created a Facebook page, a website for Hank, a Twitter account, a YouTube channel. She made videos of Hank. The power of social media descended on the county. He said that while Hank was deemed earlier to be a dangerous dog, circumstances since then — especially the actions of Hanson and York — showed he wasn’t believed to be dangerous. 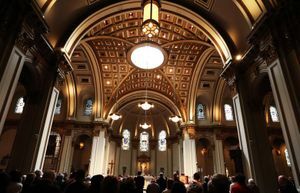 “That doesn’t have much significance legally speaking, but I believe it does when looked at under the terms of equity,” Skinder said, in explaining his ruling. John Justice, the private attorney representing Lewis County, says he hasn’t had a chance to discuss with the county what to do next. The county could challenge, or reach an agreement and walk away from the case. 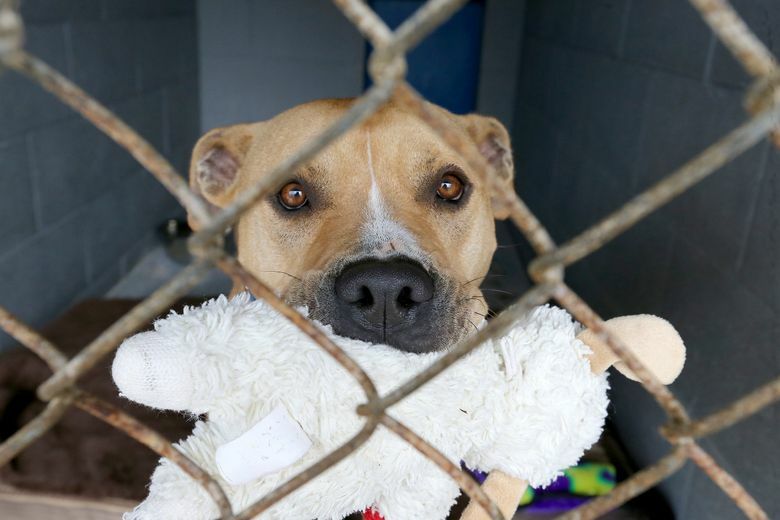 Propp-Estimo drove to the shelter Wednesday after the hearing to get her dog.